Google Drive, accomplished as a perfect solution for digital data storage need. It was launched in April, 2012. Available on almost every recognized platform for instance MAC & PC, Chrome, iPhone & iPad and android devices. It lets you work on your files from anywhere over the globe and at any time you like. 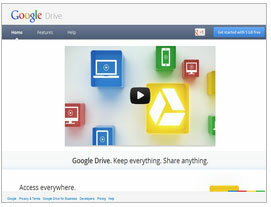 Google Drive support over 30 file types on your browser – importantly Adobe illustrator, Photoshop and HD videos. Google, through launching their own cloud storage facility ‘Google Drive’ is keeping alive their trend of offering products with a difference. It's more than just a cloud storage facility, as it becomes the home of Google Docs, a web based office suite – offers bulk of productive applications to work on spreadsheets, presentations and document editing tools. Get started with google drive for 5 GB of free space for not just file storage but also to share your files with anyone. You can create & edit documents, presentation and spreadsheet together with your mates even they are thousands of miles away, through any device – you can see the chances instantly. When your requirements exceeds you can switch to paid package as cheap as $ 2.49 per month for 25 GB. The powerful search feature lets you find your files faster. You are provided with option to search content through keywords or filter it according to file type and etc. Google drive also facilitates you by sharing your stored pictures in google+, now sharing images with your circle is just one click further. Google Drive Review - Read our in-depth Google Drive Cloud Data Storage Review to evaluate the best plan from varied options on the basis of features, storage space & pricing!